Tony Barrett writes for Joe now, having formerly been the chief Liverpool correspondent at the Times, and was suitably impressed by Roberto Firmino’s performance against Leicester on Saturday. The Brazilian, who signed for £29m last summer from Hoffenheim, scored our first and last goals, displaying a coolness in front of goal that is perhaps only comparable to Daniel Sturridge among his team-mates. Firmino has three goals for the campaign in total, and bar the away defeat to Burnley, has been superb since the beginning of the campaign. The 24-year-old had the whole of pre-season to get ready, having been stupidly ignored by Brazil for Copa America and Olympic duty, but their loss is our gain. “Somehow, Roberto Firmino’s ongoing emergence as arguably Liverpool’s best and most influential player has been largely overlooked over the last 12 months, but after his stunning performance against Leicester City at the weekend the secret is finally starting to get out. 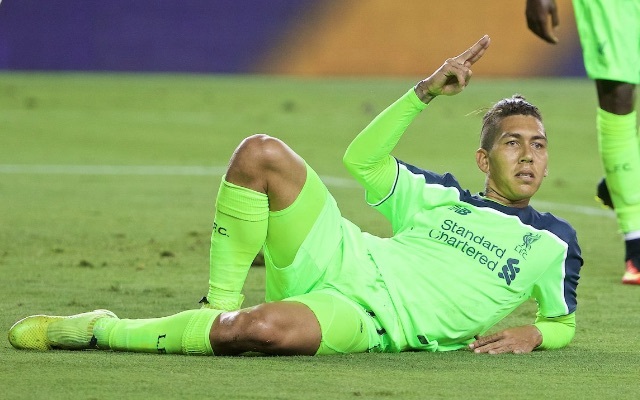 “While most of the attention is drawn to Philippe Coutinho or Daniel Sturridge, Firmino has made the most of others hogging the limelight by quietly going about the business of being effective and productive. “Aside from Sturridge, he is Liverpool’s best finisher. Aside from Coutinho, he is Liverpool’s most creative player. Even before he had opened the scoring on Saturday, the Brazilian had already dazzled Anfield with the kind of touch play for which Mesut Ozil is renowned. “From taking dropping balls out of the sky with his instep with maximum ease and minimum fuss, to threading short passes through gaps to open up spaces in and around the penalty area, Firmino’s technique means his lack of searing pace does not hinder him as it does others who operate in a similar role. Seeing Firmino at first hand you can see why Klopp has so much time for him. He takes up wondrously intelligent spaces. He doesn’t possess great pace but he gets away with it because he has such utter quality on the ball. His first goal showed just this – running into space and scoring with his second touch after fantastically wrong-footing the Leicester backline. Away from home on Friday, don’t be surprised if Daniel Sturridge drops to the bench and Firmino plays the false-9 role, with Coutinho coming back into the team on the left-wing.